In celebration of the exciting news that a Wegmans supermarket is coming to Brooklyn, I thought I’d dig out from the archives an article I wrote during my first year in grad school, when I was a very un-ripe twenty two. I was taking a class on propaganda, and I decided to focus my final paper on how propaganda techniques could be spatialized in retail design. I knew the perfect case study. When I was growing up in Central Pennsylvania, we’d occasionally trek north to Williamsport for the Little League World Series, or to visit the music store where I bought and serviced all my musical instruments. 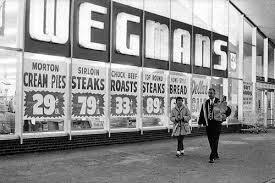 And while we were in town, we’d sometimes stop at Wegmans. I always wished we could have such a good-smelling, chromatically riotous wonderland closer to home — but Wegmans didn’t come to State College until after I moved to New York, in 1998. Since then, when I’ve been home visiting family, I’ve made many visits to the hometown shop. Now they’re coming to me here in New York — yet, I regretfully admit, I doubt I’ll visit them after they settle in at the Navy Yard. Because Brooklyn tends to take good things and make them insanely annoying. Speaking of annoying: let’s get to it. Here’s the barely post-adolescent me — speaking to you from across time, in 1999 — on grocery merchandising. I did some “fieldwork” at the Williamsport Wegmans for this story. My note-taking and not-surreptitious-enough photographing freaked out the manager, who asked me to leave. I was quite proud of my transgression. You double-check the list: milk, bread, and orange juice. Easy enough. The bread’s in the last aisle, and the milk and o.j. are in the back, left-hand corner of the store. Should take five minutes—max. Don’t need a cart—just a shopping basket. Ooh, do I smell apple pie? Why, yes. There’s a chef baking apple pie in the produce section. And there’s a special on Granny Smith apples. I’ll pick up a half-dozen. And what’s this? Caramel apple dip? Mmmm. Let’s try it. And if I’m making a pie, I need stuff for the crust. I’ve got flour and butter. Oh, I’m out of cinnamon. I’ll just pop into aisle four and pick up some cinnamon—and ginger. And, oh wow, this looks great: salt-free vegetable seasoning. Now this would be wonderful on some grilled veggies. I could just hop back over to produce and pick up some carrots, cauliflower and broccoli, maybe some squash. Oh, yeah, and those little button mushrooms, too. Okay, good. That’ll be tomorrow’s dinner. Now, what did I come here for? Milk. Back, left corner. I’m walking directly to the back left corner. My attention will not be diverted. But hey, what’s this? They’re cooking some nice steaks in the butcher shop. I really shouldn’t, but it smells heavenly. I’ll pick up a few and freeze them. Okay, now for the milk. I’m walking to the milk. All I need is milk. Hold on. Free samples. Can’t pass up free samples. Oh, my. Cheese and crackers. Ooh, fantastic. This would be perfect for the office party tomorrow afternoon. Great. Now: milk. Skim, where’s the skim? Do I want fat free skim, light skim, heart-healthy skim, skinny skim, or organic de-creamed milk? The organic stuff is probably chemical-free. I’ll take it. Oh, and over here’s the o.j. I forgot about that already. I’ll pick up some calcium-enhanced juice. Cool! Here’s that new orange mango kiwi juice I saw advertised yesterday. I’ll try it out. Alright, the basket’s full. Time to head to the checkout. Do I have everything? No, I need bread. Bread, bread, bread. Here it is. Whole wheat? Whole grain? 100% Natural whole grain? Wheat-free natural? Stone-ground whole grain? Sheesh. But, wait. The store bakery makes its own whole wheat. And I bet it doesn’t have any preservatives. But the bakery’s back by the deli. We’ll just run back there quickly. Here it is: 100% whole wheat. Good. Let’s get out of here. Hey, check out these muffins!…. Sound familiar? Rarely is a trip to the grocery store a simple in-and-out dash. Retailers wouldn’t allow it. They want to keep you in the store as long as possible. They want you to come into contact with as much as the merchandise as possible. Simply because they want you to buy as much as possible. Why is it that we always end up leaving the grocery store with much more than we had intended to buy? What is it about that huge, impersonal, warehouse-like space that turns our willpower to mush? We needn’t be ashamed. In the grocery store, we’ve got a whole system working against us. Retailing—specifically, merchandising and retail design—is a science, a technique. The grocery store is an immersive, hermetic medium for propagandistic communication. But we rarely see it as such. The whole place has been masterminded by a ‘supermarket architect’ whose aisle and ‘endcap’ strategies optimize your viewing angle and tantalize your kids. Every decision about color, light, temperature, smell and even music has been scientifically calibrated to excite the buying impulse. And with good reason. A full two thirds of the purchases made during the 107.8-minute average visit to the supermarket are unplanned… (47). If only we knew the retailer’s stealth strategies. If only we could recognize the totality of forces converging in a retail outlet, impelling us to buy, buy, buy. We must learn how to read our environments: to identify the propaganda techniques employed in retail design and to recognize the connection between particular design choices and consumer behavior. Perhaps by understanding the science, or technique, behind retail design and merchandising, we can better understand why we are compelled to consume—and then better control those compulsions. According to Michelle McLachlan (“Food for Thought”), “few retail categories are as sensitive to changing shopper lifestyles and habits as the grocery and supermarket segment. Few categories are as sensitive to new ways of presenting merchandise or layout of stores….” Grocery stores face increasing competition from eat-in and take-out restaurants, large-scale “food clubs,” and e-commerce. They must accommodate dual-career households with strict time constraints. 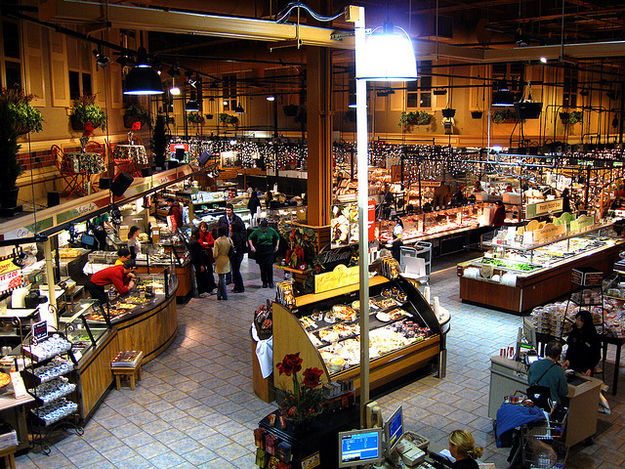 In response to these market dynamics and demographic changes, grocery store designers must create an environment that “stimulates and communicates with the customer”; they must fashion an entertaining and emotionally and viscerally appealing experience (McLachlan, “Food for Thought”). Michael Friedman writes: “Shopping is an instinct. People love to go shopping, but they don’t like to go shopping for boring items. Good graphics, lighting, colors and layout are what make a store exciting. What’s needed is a sense of discovery.” The grocery store isn’t just a store anymore. It “aestheticizes” and animates our “instinct” for food shopping; it turns this instinct into a fetish. In Propaganda: The Formation of Men’s Attitudes, Jacques Ellul explains that propaganda “short-circuit[s]” all thought and decision (27). It works at the level of the unconscious. It exploits our needs, instincts, customs, and “unconscious habits” in order to “persua[de] from within” (64). We have a biological need for food, but advertising and merchandising—in short, all of consumer propaganda—create supplemental, superficial needs. We don’t just need fuel for our bodies; we need fat-free, organic, kid-tested/mother-approved, 100% natural, free-range fuel. The grocery store—a hermetically sealed environment full of visual, verbal, olfactory, and tactile stimulation—provides the perfect container, or medium, for this inside-out propaganda. It’s an immersive environment. The grocer “leaves no part of the [consumer’s] intellectual or emotional life alone; man is surrounded on all sides” (Ellul 10). Today’s grocery stores seem to be completely self-sufficient worlds. Many now have their own post offices, pharmacies, banks, photo centers, restaurants, lounges, and even doctor’s offices. Dependent solely on fluorescent lights for visibility and a ventilation system for oxygen, the consumer has nearly no contact with the outside world. Few stores have windows. Ellul suggests that this isolation is necessary in a propagandistic environment, where the consumer “must not have outside points of reference” (17). The grocer must “create a complete environment for the individual, one from which he never emerges” (Ellul 18). The consumer does eventually “emerge” from the grocery store—but he never escapes from the consumer environment. The retail outlet serves as only one element of the consumption “system.” Ellul recognizes that propaganda depends upon a “totality of forces”—including advertising, other media products, education, etc. The propagation of the consumer myth depends upon a “total propaganda.” “The propagandist must utilize all of the technical means at his disposal—the press, radio, TV, movies, posters, meetings….” (Ellul 9). And, I would add, public space—in this case, commercial space. …an important medium for transmitting messages and closing sales is now the store and the aisle. That building, that place, has become a great big three-dimensional advertisement for itself. Signage, shelf position, display space and special fixtures all make it either likelier or less likely that a shopper will buy a particular item (or any at all). The science of shopping is meant to tell us how to make use of all those tools (32-3). The merchandising technique also favors a particular methodology: ethnography. Ellul writes: “what is needed nowadays is an exact analysis of both the environment and the individual to be subjected to propaganda” (4). Thus, both a macro- and micro-level contextual analysis will provide the retailer with data regarding “the sentiments and opinions, the current tendencies and the stereotypes among the public he is trying to reach” (Ellul 34). Third, merchandising’s techniques depend on control; its procedures are “rigorous, precise, and tested” (4). The retailer must “control [the technique’s] use, measure its results, define its effects” (Ellul 4). Efficiency. The supermarket must position itself as the most efficient food-shopping destination for its consumers. Michelle McLachlan of Display & Design Ideas (“Food for Thought”) suggests that grocers place prepared foods at the front of the store “both as reference points to attract shoppers and as aids for the convenience of shoppers in a hurry.” She recommends rotating the merchandise throughout the day in order to appeal to consumers with different needs: single portions at lunch for business people on the run, family portions in the evening for homeward-bound moms (“Designing Dinner”). 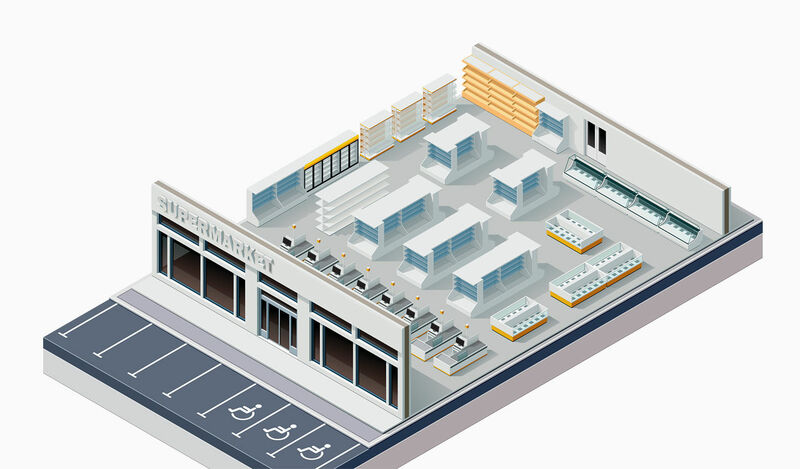 McLachlan also foresees tomorrow’s grocery stores becoming multifunctional town-centers, complete with party planners and caterers, dry cleaners, restaurants, and banks. This “one-stop shopping experience” could decrease the time and hassle of grocery shopping. But merchandising techniques must also prove efficient for the grocers themselves. Underhill measures retail design efficiency in terms of a few key variables. First, the conversion/closure rate refers to “the percentage of shoppers who become buyers” (35). Second, the in-store time—that is, the amount of time a customer spends inside the store—is “perhaps the single most important factor in determining how much she or he will buy” (37). In order words, retail designs and merchandising plans that invite the consumer to linger and browse typically yield higher sales. Third, the interception rate refers to the number of shopper-employee contacts. A retail design that allows for maximum contact between consumers and workers usually increases the size of individual sales (Underhill, 1999, 37). Finally, waiting time influences profitability. Thus, efficient delis, checkouts, etc.—those with little or no wait—usually encourage purchases. Arthur Andersen’s Senn-Delaney consulting group turns the food retail outlet into a well-oiled machine. The group offers guidance in category management, franchising, foodservice/meal solutions, labor management, perishables improvement, shrink management, store expansion, store layout & design, technology implementation, and other retailing functions (www.senn-delaney.com, “Satisfying Grocery Customers”). Their Customer Satisfaction Program, they claim, can produce a two-percent increase in grocers’ sales. As part of their efficient category management program, Senn-Delaney and their clients “plan strategically and think analytically and creatively” in order to develop business strategies “category by category” (www.senn-delaney.com, “Capturing Categories that Drive Traffic”). 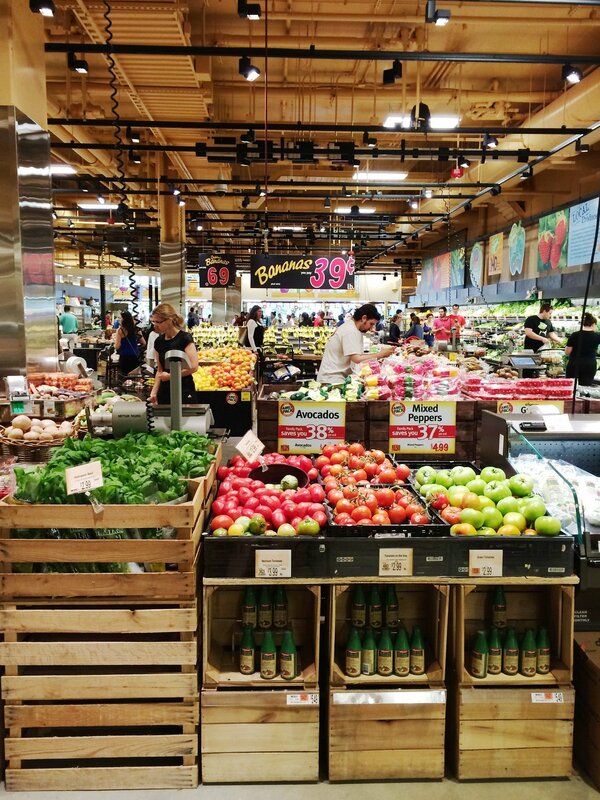 Senn-Delaney even optimizes areas that other consultants overlook—including the staging, packaging, processing and storage areas of a grocery store (www.senn-delaney,com, “Design Your ‘Store of the Future’”). The consultants also explore technology opportunities that can “improve the customers’ perception of value and achieve operational and financial goals” (www.senn-delaney.com, “Computing Technology Opportunities”). Logistical-efficiency and cost-efficiency seem to be the retailers’ primary goals. Because space is at a premium, and because grocery retailing typically offers only a two- to three-percent profit margin, grocers must design and spend wisely (“To Market, To Market”). Senn-Delaney advises its clients to employ flexible retail designs so that retailers can “quickly modify store layout, marketing strategies and the merchandising mix to satisfy customer demands without incurring significant capital investment” (www.senn-delaney.com, “Design Your ‘Store of the Future’”). In short, efficiency means balancing customer satisfaction with retail profits. Research: Context. But how do grocers know what makes their customers happy? They must know the playing field. As Ellul recognizes, a company must conduct research on both a macro- and micro-level; grocers must familiarize themselves with the individual consumer, the consumer society, industry trends, market climate, etc. Such research involves psychology, sociology, anthropology, kinesthetics, anatomy, and a host of other humanistic “-ologies” and data-driven “-istics.” For example, Senn-Delaney derives its Customer Satisfaction Index by measuring customer satisfaction through focus groups, interviews, and surveys; by comparing satisfaction levels with competitors’ levels; and by identifying “critical, high yield opportunities for revenue enhancement, cost reduction and improved customer satisfaction” (www.senn-delaney.com, “Satisfying Grocery Customers”). Underhill adopts a less methodical approach to data collection. He and associates from his company, Envirosell, sit for hours in a store, observing physiological and anatomical factors like customers’ bodily movement, transit obstacles, walking pace, line-of-vision, and hand and arm carrying capacity. They also examine behavioral differences based on gender, age, and other demographic and psychographic factors. But Underhill favors aesthetic, or sensory, analysis above all. He focuses on how consumers interact with or experience merchandise: how they test the firmness of a head of lettuce, savor a free sample of Virginia ham, squeeze the Charmin, knock on melons, and shake bags of potato chips. He writes: “…the most powerful inducement to shopping—the opportunity to touch, try, taste, smell and otherwise explore the world of desirable objects, and how the artful juxtaposition of those objects can sometimes make all the difference in the world” (164). Control. Underhill’s field notes and Senn-Delaney’s indices and codes allow for definition, measuring, and testing. They foster rigor and precision. Such indices allow Senn-Delaney to quantify as much of the shopping experience as possible—and these numbers promote a sense of control over the environment or understanding of the frustratingly irrational consumer. The group regularly measures such variables such as average wait-in-checkout, average grocery out-of-stock, and average customers-per-cashier-hour. They know that customers wait at the check-out for an average of 7.7 minutes, but with the proper improvements, a grocer can cut the wait to one minute (www.senn-delaney.com, “Satisfying Grocery Customers”). 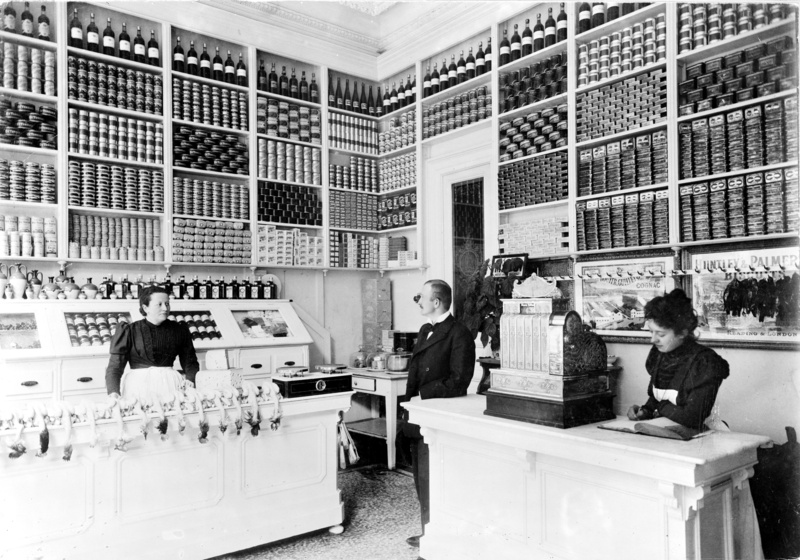 On average, cashiers handle 25 customers per hour, but with the proper technological and logistical corrections, a grocer can increase that number to 36 (www.senn-delaney.com, “Satisfying Grocery Customers”). “Optimizing” the grocery store requires continuous monitoring of these variables. Senn-Delaney, for example, works with its clients to develop an automated “layout scorecard” that continually measures the impact of implemented layout changes (www.senn-delaney.com, “Design Your Store of the Future”). Accurate definitions of variables and rigorous measurement allow the retailer to exercise control over the customer’s satisfaction—and ultimately over the store’s profitability. Strategy: Implementing the Research. How does the retailer “operationalize” this rigorously collected data? Some retailers use demographics and psychographics in planning their retail design. Michael Friedman claims that a designer must know his or her “audience” (the consumer) in order to create a shopper-friendly environment. For example, baby-boomers, who are typically less mobile than younger consumers, require smaller stores, an easily maneuverable layout, and ample seating/resting areas. Michelle McLachlan suggests regionalizing grocery stores: individualizing stores in a chain by tailoring merchandise to local demands. 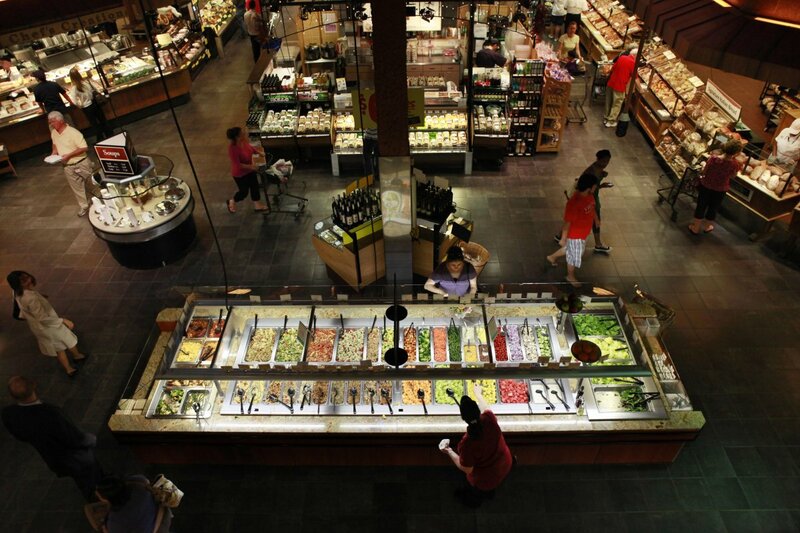 Wegman’s, an upscale New-York based grocery chain, draws on psychographic data. Through market research, the retailer determined that health is important to its target consumer. So throughout their stores, Wegman’s displays signs with nutritional information and offers nutritional brochures. All of these customization programs serve a dual function: they serve both to accommodate, or entertain, the consumer and to “elicit spending” (Friedman). Underhill incorporates knowledge of physiology and anatomy into design choices. He suggests that in creating and positioning signage, retailers must consider what shoppers will be doing, thinking, feeling, seeing, etc., in each zone of a store. “You have to deliver the information the way people absorb it, a bit at a time, a layer at a time, and in the proper sequence” (Underhill 62). 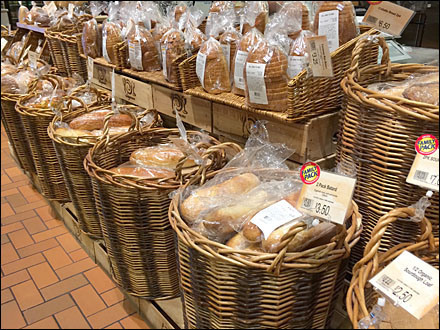 If customers seem bogged down at a particular area in the store, retailers should provide extra baskets or carts. After all, the more they can carry, the more they’ll buy! In addition, Underhill says that store layout should be informed by considerations of “flow.” The retailer must decrease or eliminate blind spots and obstacles to movement. Optimal design “understands our habits of movement and takes advantage of them” (Underhill 76). It also exploits effective synergies and adjacencies—zones or products that, when positioned in close proximity, promote cross-purchases. For example, if a grocer shelves spaghetti sauce right beside the pasta, a consumer is likely to pick up a container of each in a single movement. In his hundreds of hours of observing customers, Underhill has identified a few environmental factors that enhance the grocery shopper’s experience and consequently increase the likelihood that he or she will make a purchase. First: touch. The retail environment must involve the customer; it must maximize “shopper-merchandise contact” (168). 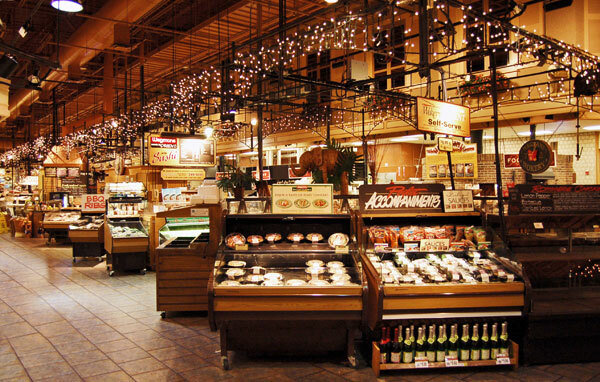 Grocers can turn their stores into a “sensualist’s journey” by offering food samples, demonstrating food preparation in a test kitchen, or by grilling some steaks in the meat department. Second: discovery. The store layout should “…seduce shoppers through the aisles with hints of what’s to come” (Underhill 158). Wegman’s employs a “looping” layout—not your typical supermarket circuit—to guide shoppers through the store. As the customer enters the store, he or she encounters the produce section, an open area featuring “islands” of fruits and vegetables, many of which are displayed in rustic crates, decorative baskets, or farm wagons. Around the perimeter of this area are the cake bakery, the bread bakery, the deli, a fruit bar, a dessert/pastry bar, and the prepared food section. As the customer “loops” through this area, he or she inevitably loops by certain displays repeatedly. If a customer passes by those tempting muffins or appetizing prepared foods enough times, he’ll eventually break down and buy something. Store layout maps out and sequences the shopper’s experience in the store. As Underhill says, retailers must take into consideration what shoppers are thinking and feeling during particular stages of the shopping experience. When the shopper enters the store, he or she is in the mood to buy—and perhaps most vulnerable to visual merchandising “tricks.” Therefore, retailers typically put the most attractive products…and the fresh foods up front (“To Market, To Market”). These goods appeal visually to the consumer and at the same time provide a high profit margin for the retailer. Home Meal Replacements, typically positioned in coolers close to the front entrance, can secure 40% to 60% profit margins (McLachlan, “Designing Dinner”). The necessities, like milk, juices, and eggs, however, are positioned at the farthest possible distance from the store’s main entrance. A shopper may think he’s dropping by to pick up some eggs, but when he treks back to the far right corner of the store, he inevitably passes hundreds of enticing displays. It’s highly unlikely that he will leave with nothing more than a dozen eggs. Wegman’s positions displays of appliances and other high-margin goods adjacent to appropriate food sections. For example, in between the butcher shop, the seafood section, and the produce area, Wegman’s had constructed a pyramid of George Foreman Fusion Grills—perfect for grilling a steak, a filet or fish, or some fresh vegetables. “Zoning” techniques determine which products are placed where. Retailers group product categories into zones in order to encourage customers to purchase an entire “ensemble” of goods. A retailer might position breads, meats, cheeses, and condiments together in a picnic-themed display in order to encourage customers to buy all the ingredients needed to construct the perfect sandwich. In Wegman’s “Football Zone,” the retailer has arranged sausages, cheeses, chips, dip, pretzels, tortillas, and salsa on a cart draped with football team flags and pennants. If someone is hosting a football party, he or she can easily pick up a few packages of each of these “football foods.” The “Holiday Cookie Zone” features chocolate chips, butterscotch chips, peanut butter, coconut, M&M’s, shortening, evaporated milk, etc.—all the ingredients for a batch of homemade cookies. McLachlan suggests creating “separate merchandising areas…with distinct presentation elements” for each product category (“Food for Thought”). Aesthetics help to “thematize” distinct zones of the store. A theme packages all the goods displayed in the zone into a narrative, a “stage set,” or some other sensory appeal strategy. Themed zoning encourages consumer involvement with the merchandise, extends the time the consumer spends in the store—and, consequently, increases sales. McLachlan suggests that grocers zone their Home Meal Replacement (HMR, or prepared foods) areas as separate establishments, with their own entrances and check-outs. She advises the grocer to incorporate flattering lighting, graphics explaining the food preparation, and handsome visual merchandising in order to create an upscale, entertaining atmosphere. Appropriate presentational strategies can de-emphasize the “packaged” nature of “pre-packaged” foods. According to Michael Crosson of Jon Greenberg Associates, a classy presentation can build consumer confidence, reinforcing the sense that “This is the same thing I’d do at home if I had the time” (McLachlan, “Designing Dinner”). Thus, in theming and presenting its merchandise a retailer must take into account the consumer’s thoughts and values. Grocers must consider how a working mother feels about stopping by after work to pick up a pre-cooked lasagna for her family’s dinner. Crosson claims that the presentation must “appeal to both the social elements of eating, and the practical” (McLachlan, “Designing Dinner’). According to Nick Giammarco, president of Marco Design Group, grocery shopping is no longer a necessity; today, it’s is a “lifestyle trip” (McLachlan, “Designing Dinner”). Today’s grocers have to somehow make chicken breasts and Cheerios exciting—and associate them with a desirable lifestyle. Harris Teeter, a North Carolina-based grocery store chain, uses a “stage set” approach to zoning. Rush Dickson, Senior Vice President of Design and Image Development, says: “It’s an attempt to create some atmosphere for what can be pretty boring merchandise” (“To Market, To Market”). Wegman’s has turned its bakery into an open theater. Customers can watch as bakers knead dough or craft icing flowers for a wedding cake. The store also hosts a weekly televised cooking demonstration. But retailers can also opt for a more low-key approach to theming. Demographics indicate the shoppers are spending less time at home. In response, some designers have created a domestic ambiance in order to draw customers into the store. Wegman’s, for example, displays its wares in baskets, urns, or wagons, on fruit carts or antique hutches, and even in bathtubs. Many, like Wegman’s, have incorporated coffee bars to invite relaxation and prolong the store visit. Such domestic touches convey a sense of comfort and familiarity; they blend repose and active consumption. Its practitioners are as guilty as their fellow designers of the postmodern game of self-reference, introducing a hyperreal handful of digestible signifiers and meta foods into cereal and snack bowls: French Toast Crunch, a shrunken version of its namesake; Swiss cheese-flavored crackers, manufactured in the shape of pieces of Swiss cheese. But snackitects also face the kinds of constraints familiar to all designers. Their constructions must simultaneously impress two clients, child and parent, with diametrically opposed expectations (61). Hall captures what is perhaps the greatest challenge of design: balancing its appeals and its obligations. Balancing Appeals. According to Ellul’s model of propaganda, grocery merchandising and retail design depend upon stabilizing a host of appeals and strategies and motivations. Perhaps most important, though, is the supermarket’s ability to combine integration and agitation propaganda. Design, merchandising, and operational (management, logistical) strategies promote a myth: the consumer myth—an ideology based on manufactured needs, superficial satisfaction, and waste. But they also communicate a call to action: a call to buy. And this call arises through a mixture of overt propaganda—signage, coupons, fliers, advertising—and covert propaganda—zoning, visual merchandising, product placement, adjacencies, and retail themes. Rooted in science, focused on efficiency, centered on control, the techniques of supermarket merchandising and design reveal what they are: a propaganda system. An enclosed, embodied, immersive propaganda system. But as Ellul suggests, awareness is a necessary first step. Maybe we can learn to critically consume our consumer environments as skillfully as we consume our media products and packaged goods. We can learn how to read our built spaces. The idea of spatial literacy requires that we begin to ask new questions: Hey, haven’t I passed by this chocolate display five times now? Why are there tiki torches in the meat section? When—and why—did my optometrist move his office to the Shop-n-Save? Sure, they seem like silly questions—but that’s only because they haven’t been asked before. And that’s because we rarely regard space as an ideal medium for propaganda, but it is. Don’t believe it? Just check out your grocery bill. Dugdale, Juanita. “Order in the Court.” Interiors March 1999: 32-4. Ellul, Jacques. Propaganda: The Formation of Men’s Attitudes. New York: Vintage Books, 1965. Food Marketing Institute. “Supermarket Facts: Industry Overview 1998.” 1998. 11 Nov. 1999 <www.fmi.org/food/superfact.html>. Friedman, Michael. “Future Shop: Industry Pundits Peer Into What May be in Store for Supermarkets.” Progressive Grocer Nov. 1999. 11 Nov. 1999 <www.progressivegrocer.com>. Hall, Peter. “Eat Me.” I.D. Sept.-Oct. 1998: 60-63. McLachlan, Michelle. “Designing Dinner: As Consumers Spend More of Their Food Dollar on Meal Solutions, Supermarkets are Having to Upgrade Their Looks.” Design & Display Ideas. 11 Nov. 1999 <www.ddimagazine.com>. McLachlan, Michelle. “Food for Thought.” Display & Design Ideas March 1998. 11 Nov. 1999 <www.ddimagazine.com/archives/398/marstor4.html>. Pearlman, Chee. “Editor’s Note: Food for Thought.” I.D. Sept.-Oct. 1998: 47. “Senn-Delaney.” Arthur-Andersen Website. 11 Nov. 1999. <www.senn-delaney.com>. 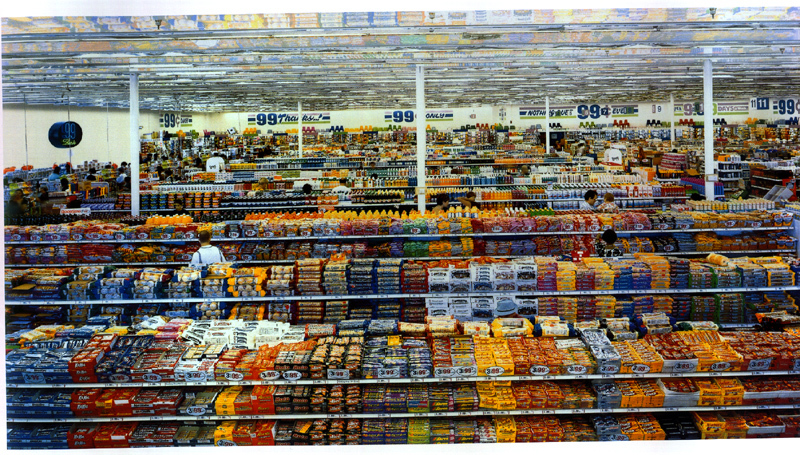 “To Market, To Market: Supermarkets Right for Time and Stomach Share.” Visual Store. 11 Nov. 1999. <www.visualstore.com/main/newsstand/Supermarkets.html>. Underhill, Paco. Why We Buy: The Science of Shopping. New York: Simon & Schuster, 1999. Vanderbilt, Tom. “The Sugar Rush.” I.D. Sept.-Oct. 1998: 48-51, 85.